SPX performance has worsened as the day winds down; VIX jumps 5%. What's the link between realized vs. implied vol? Spot-F1 and F1-F2 yield are moving into strong support for vol shorts. US stocks (SPY, DIA, QQQ, IWM) fared quite well before the open, as well as the early part of the session. As we near the close, however, the tone has grown more muted. The NFP jobs number will be released this Friday, and I am quite interested to see how sensitive bond yields (IEF, TLT, IWM) will be if there is a large divergence between the initial release vs. expectations. I've written a decent amount about the reality that several global economic indicators have been in decline. The above chart from Bloomberg (along with some other charts from the same webpage) suggests that at least some of this deterioration in economic fortunes was not an overnight phenomenon. Economies ebb and flow. It is quite possible that both investors and policymakers were conditioned by the GFC to make mountains out of molehills. The economy can backtrack without flying off the rails. I find it positively remarkable that QoQ change to private pension assets suffered such a horrible quarter. It will be interesting to see the Q1 figures. There is increasing discussion of a retirement crisis facing US seniors. While saving is one undeniably important piece of a healthy "solid" retirement (as the article calls it), investment returns obviously matter also. One quarter does not a disaster make (well, usually). 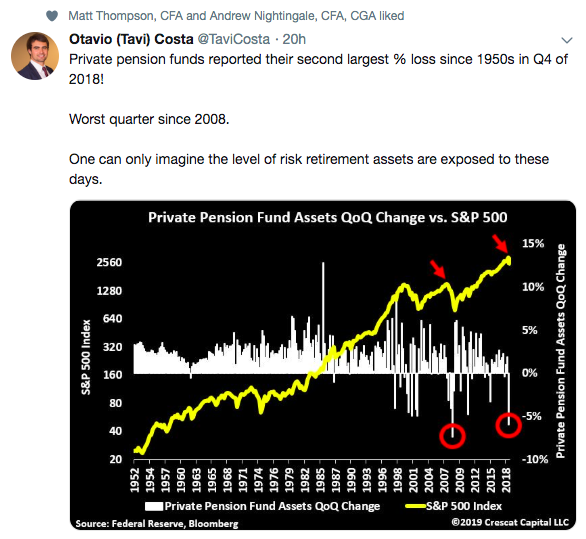 But one wonders the extent to which prudent risk management could exacerbate a downturn in markets, as large blocks of senior retirement monies could be pulled to reduce exposure to risky positions such as stocks. What is up with that, Jim!? I mention on occasion that volatility tends to be autocorrelated, or correlated with its own recent readings. While there should be a link between implied vol and realized vol, that does not mean that there is some mechanical relationship. Nor does it tell us that the link needs to be consistent. In a healthy market environment, the spread between implied and realized vol should fluctuate based on the degree to which investors believe that recent past acts as prologue. 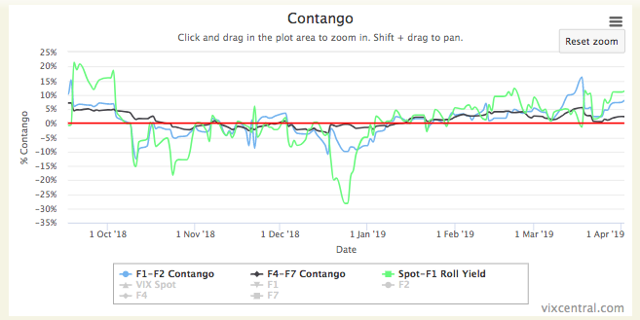 At both the Spot-F1 and F1-F2 levels, yields are moving farther in the "contango" direction. So long as the SPX can avoid sudden swerves, it is likely that the current condition will increasingly favor vol shorts (SVXY, ZIV). I mention this because there truly is scope for spot VIX to break to lower lows (see yesterday's MVB). And while the vol shorts wait, they can pick up some juicy roll yield along the way. Even as Wednesday's session draws to a close, spot VIX is sniffing out the failed SPX push to 2900 from earlier today, and has bounced heartily off the 13.00 mark. April VX expiration is not until the morning of Apr 17th. That gives the F1 plenty of time to march to the beat of its own drummer should spot indeed move lower. I'm starting to shift to the view that the front end is going to become less stubborn to down moves if spot (and other indicators) lead the way. For the last couple months I have taken the stance that VX contracts would be quick to rise, slow to fall. I think it is reasonable to loosen up on that viewpoint here if outbursts higher are swiftly contained. The large (2%) drawdown in SPX a couple weeks ago (Fri, Mar22) really showed how subject to change the VVIX could be. We're still meandering at the low end of the index's historical range, and some consolidation between 2840 and 2920 on the SPX with little intraday vol will likely go a very long way toward keeping the VIX of VIX rather suppressed. 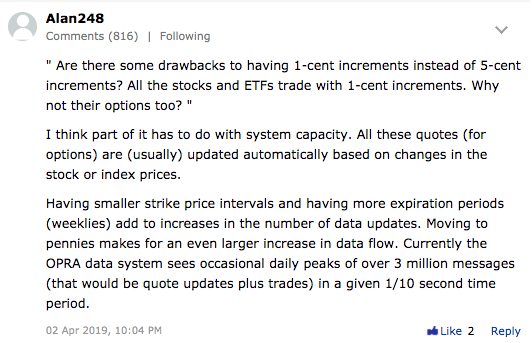 Discussion opened in an earlier piece about the nickel-wide bid-ask options spreads on the relatively new VXXB product (as opposed to penny spreads on its predecessor, the VXX). Comments relating to this topic continued in the prior MVB, and I want to highlight Alan248's contribution. Capacity limits may come into play as to why certain products trade with wider spreads. I wonder what's magical about nickels... why not $.02? Still, thank you Alan for putting forth this as a thoughtful explanation to the problem of wide bid-asks.